Yahoo Sports has launched a brand new strategy, ever since they released their own fantasy leagues, they looked for another angle. Seeing as how sports betting is still illegal in many states, being able to bet on the fantasy side is actually legal. Good examples of how this has been quite fruitful, you can check out popular sites like DraftKings and FanDuel. 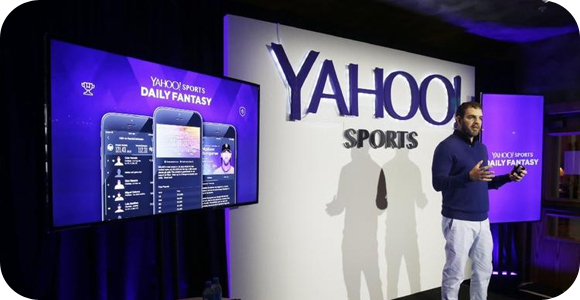 With different websites catering to these fans, Yahoo saw an opportunity to give their millions of members, which already use their services, the chance to bet on their own fantasy leagues, players, and matches. Users will be able to access this service through an app, with the exception for those that live in Arizona, Louisiana, Iowa, Montana and Washington, where any kind of betting is illegal. Yahoo has been building their fantasy experience for over 16 years, and has become very popular, as their users spend 30 billion minutes a year playing and competing. The new service allows users to assemble teams for daily or weekly contests in professional baseball, basketball and football. As the popularity continues to rise, fantasy sports betting will see an increase in players, until the entire United States get on board with legalizing this form of betting.